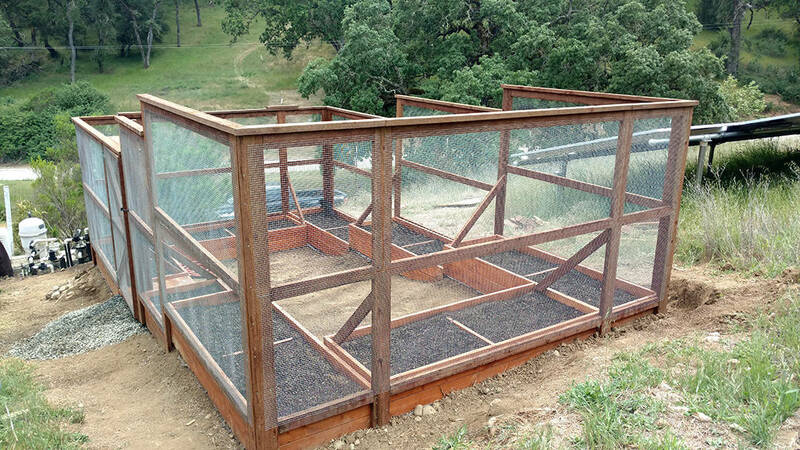 Using Henry’s plans as a basis, I built this deer proof garden enclosure on very steeply sloped land. 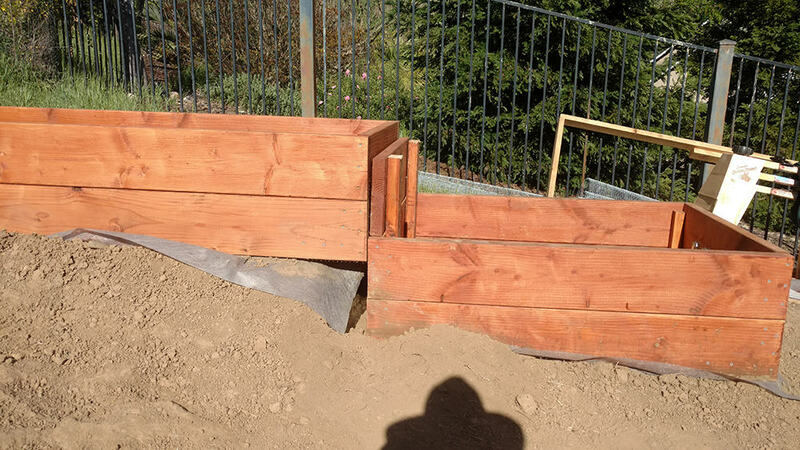 This was quite the project, and due to the steep slope, I had to modify things almost every step of the way. 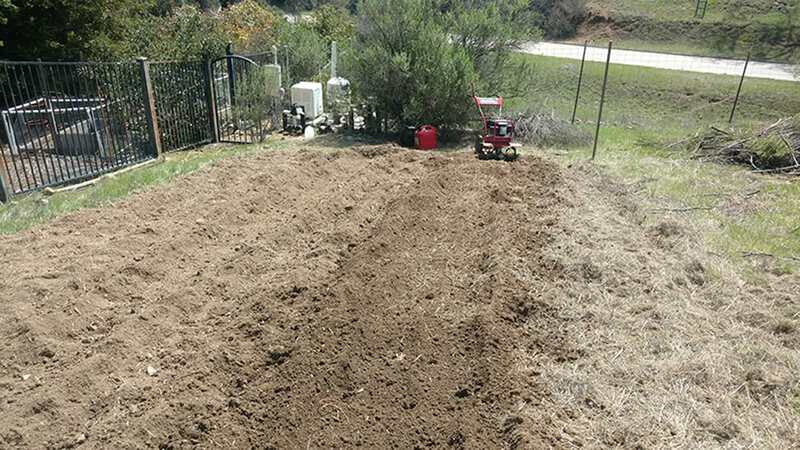 The first stage was to till the hillside so that I could move dirt around. 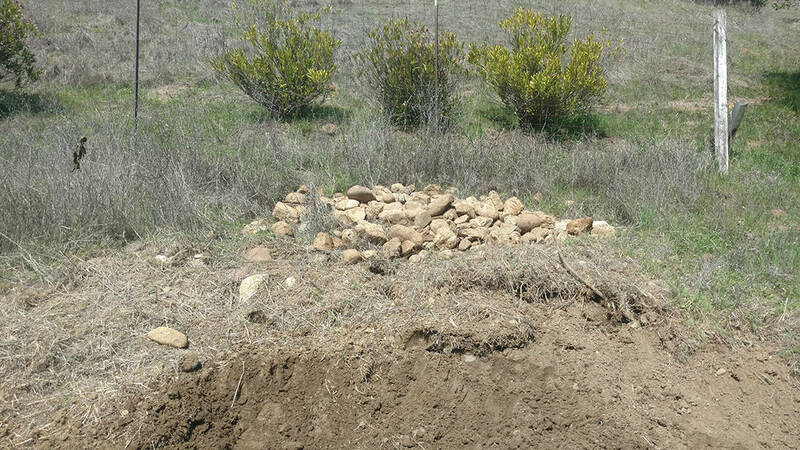 And of course there were rocks buried in the ground; lots of rocks. 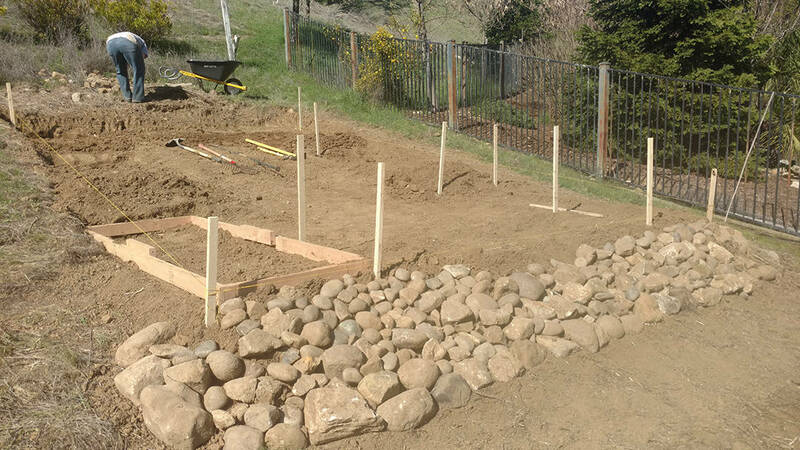 There was no way to get heavy equipment to the site, so everything had to be done by hand. This meant there was virtually no way to level the land completely. 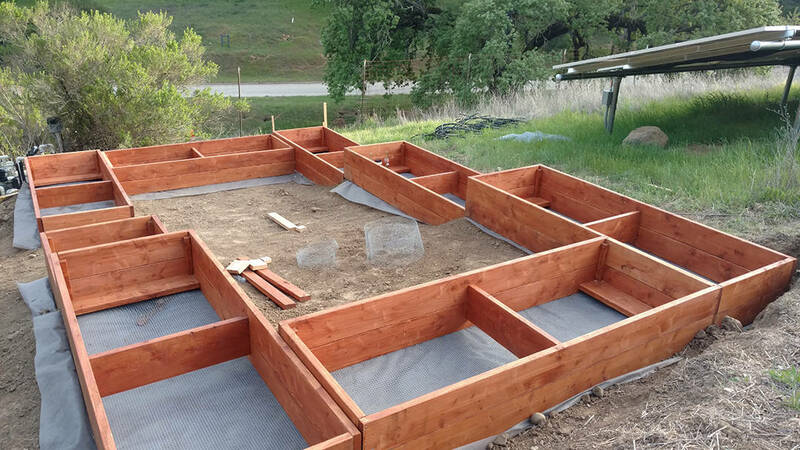 So I used a “tiered” system of stepping up each bed and leveling each tier where each bed would go. The step-ups were quite extreme in some places; so extreme that I couldn’t follow the plans exactly. For example, you will see in one photo that some of the step-ups were so high that the adjoining beds didn’t even touch. So there was no way to screw the beds together following the original plans. 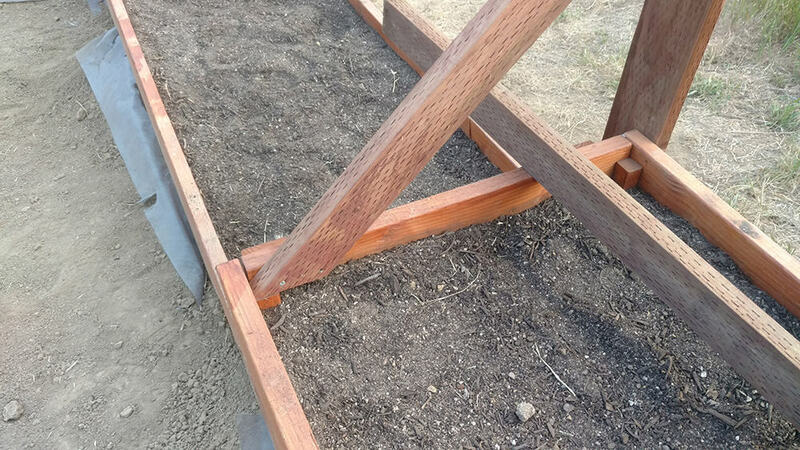 The solution I came up with was that on the lower bed instead of putting the 2 x 2’s in the corners, I put 2 x 4’s that extended up beyond the top of the bed, to the level of the higher bed. 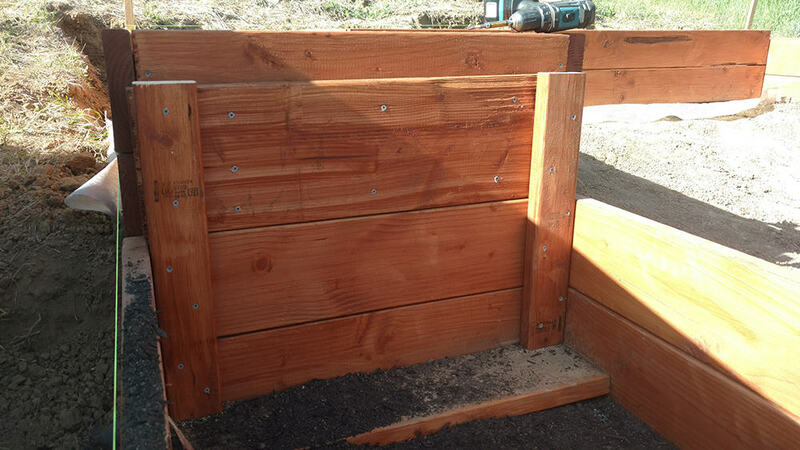 I then attached a 2 x 6 going across these two extensions, and screwed that 2 x 6 into the higher bed, thereby attaching the two beds together. Another modification made because of the step-ups (shown in another photo) was that there was an extreme step-up where the entrance platform needed to go. Because of the difference between the lower bed and the upper bed, there was no way to attach the platform to the beds (one bed was actually above the platform). 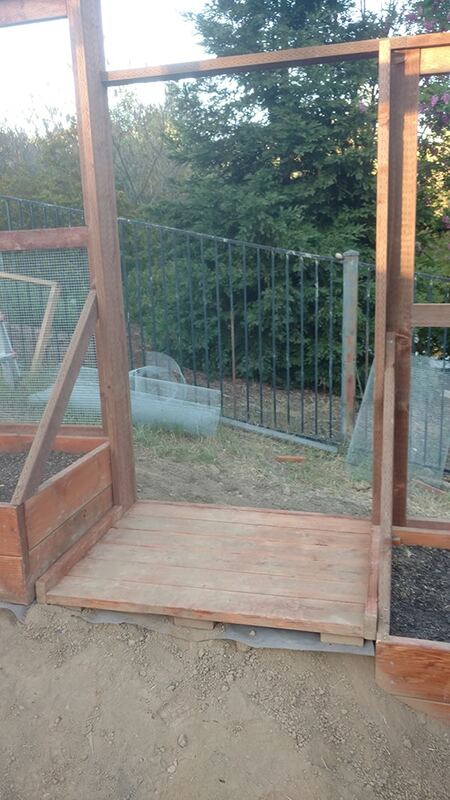 So I attached 2 x 4’s vertically to the sides of the platform, then used these “wings” to attach the platform to the beds. Other modifications included: For some reason when I tried to screw in the bracer boards to the top of the beds, as Henry did, it was splitting the boards on the beds (yes; I pre-drilled). So I just attached them to the side of the beds instead. 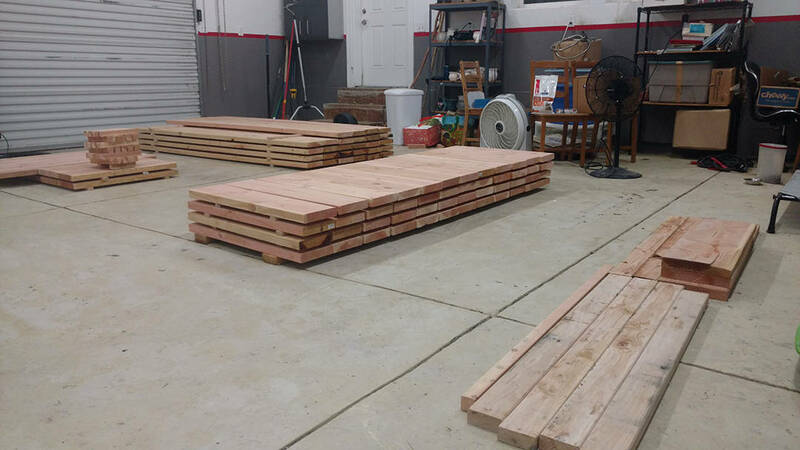 I also had no way of hauling 16 foot boards on my truck, so I had to use 8 foot boards for the top rail all the way around. On one end of the enclosure, the top rails just didn’t seem very stable and had some give (probably because my cuts weren’t exact and there were slight gaps where they joined. So I just put a small section of 2 x 4 on top of the top rail across the joining gaps, attaching it to either side to bind both sides together. This seemed to make that end of the enclosure much more stable and solid. 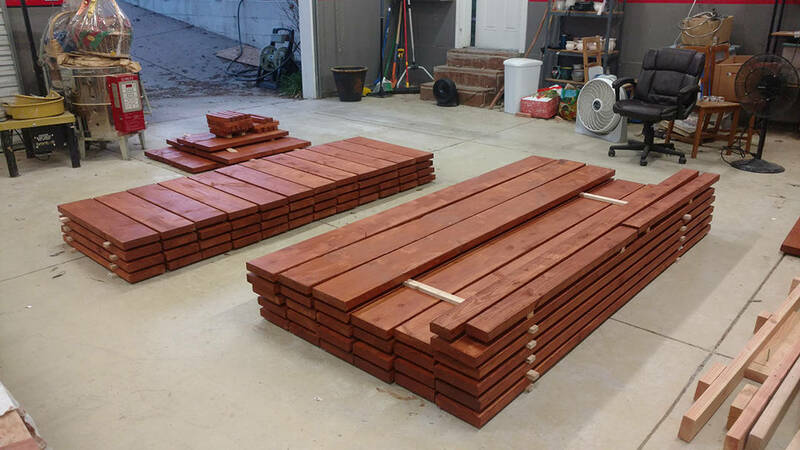 Boards for the beds were Douglas Fir, cut to size and then stained before assembly. 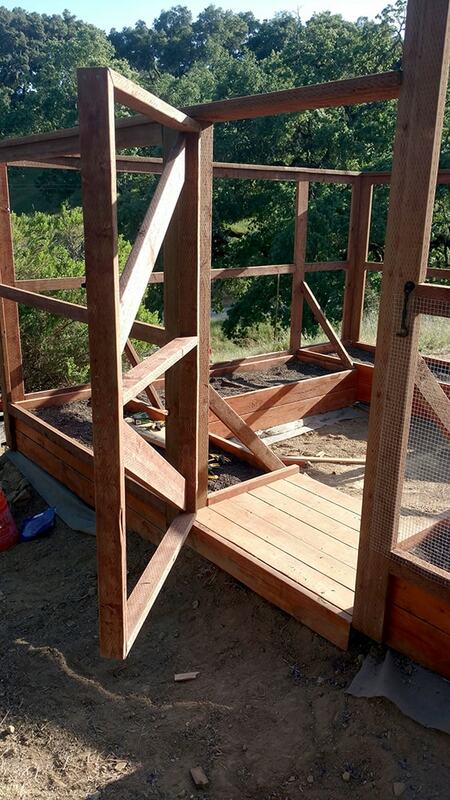 The framing boards were all pressure treated lumber. Wire mesh was 1/2″ by 1/2″ hardware cloth. I opted for this because we have a ton of ground squirrels that can squeeze through very tiny holes and are quite tenacious. And hey; if you’re gonna go overkill on a garden, why not overkill it all the way? This whole thing was HARD! The unlevel ground fought me all the way. 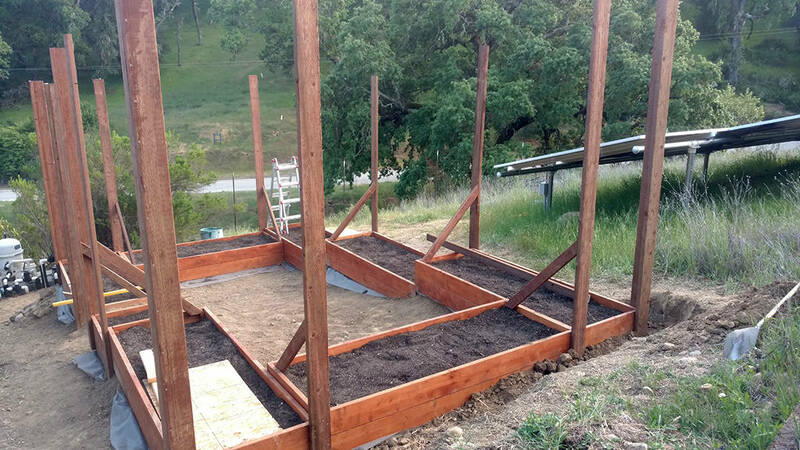 Even getting the soil up to the beds was an engineering feat involving a double-pulley system with two trucks. But I have to say the result was way better than I expected. I really like the way the tiered structure turned out. Thanks a million to Henry for all of his plans, videos, and advice! 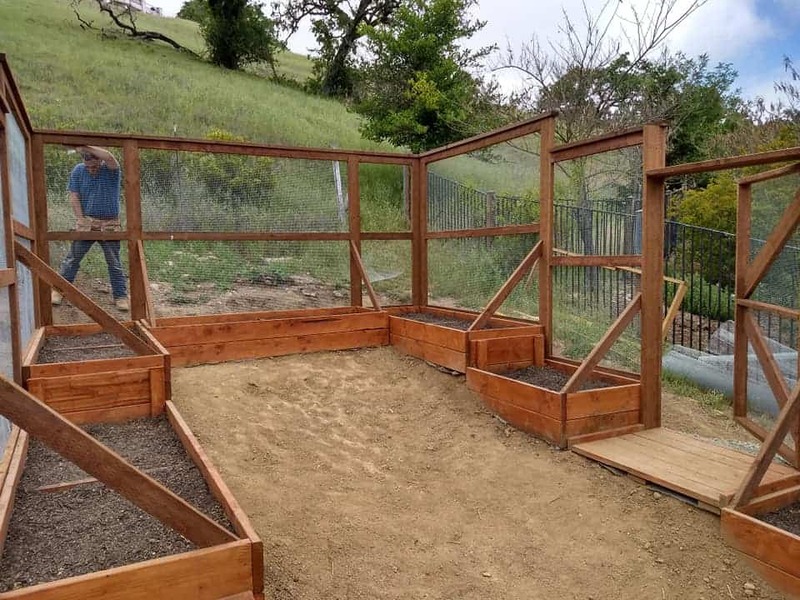 I cannot thank Henry enough for the plans, videos, and advice for making my garden enclosure project a success. It came out way better than I ever imagined. Thank you, thank you! Hello! I live in Atascadero too!! What a small world, I about jumped out of my chair when I saw that the project location was Atascadero. Great job on the enclosed garden, looks great. Good call on the hardware cloth, the squirrels and gophers here are both numerous and determined. Did you take pictures of the system you used to haul the soil up? 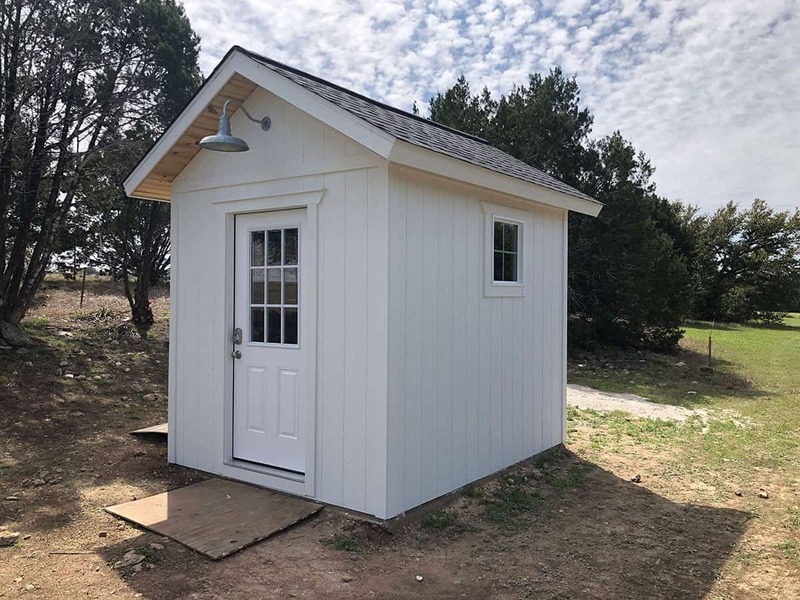 I am currently building a 10×12 shed using Henry’s plans. Once I’m done I’ll post some pictures. 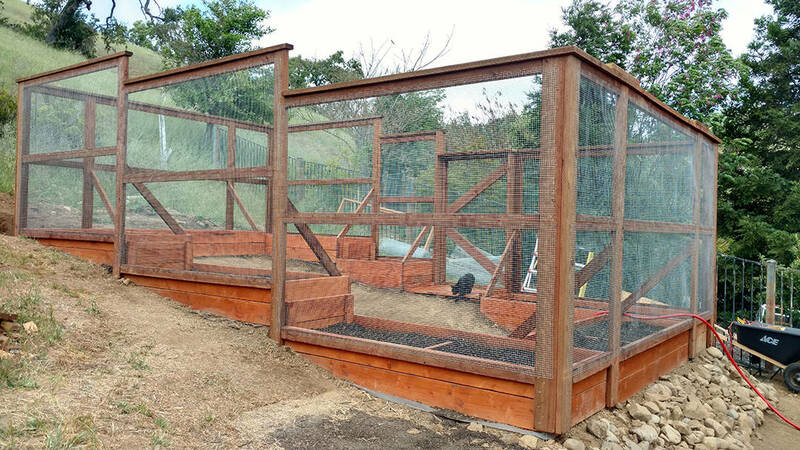 And I thought our garden enclosure was a tough go… that must have been a brutal amount of back breaking work with no machinery!! Glad to of been of help when needed (virtually anyways). Hard work done… Looks like it was totally worth it — Sure turned out very nice! 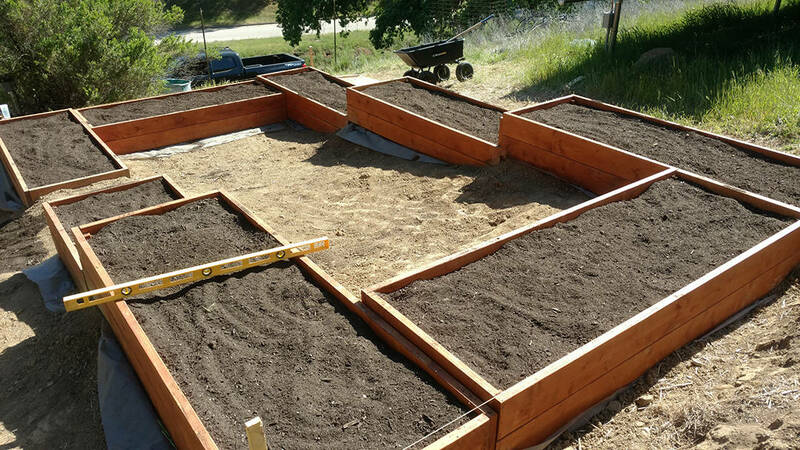 Bet you can’t wait to get some vegetables growing now. 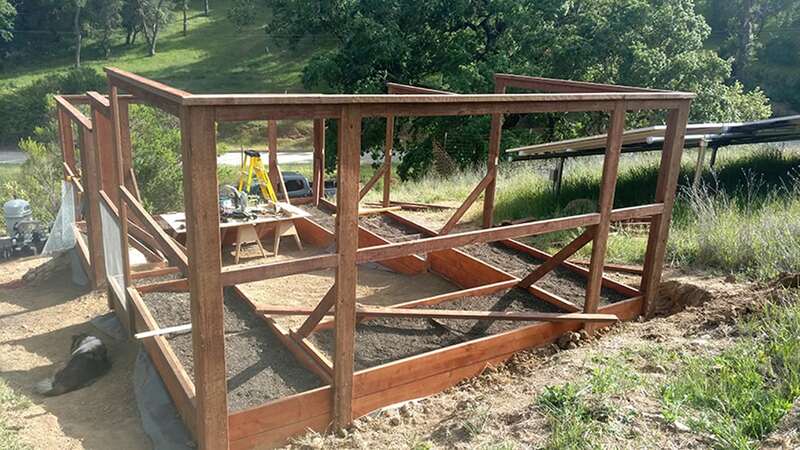 I should add… you’ve shown anyone viewing this page, that if you can build on this kind of ground and slope… you can build this enclosure anywhere! By the way – Nice Shop!